We believe that the family focus at Sandez Family Chiropractic & Wellness Center really does set us apart from other practices. And it begins for our patients during pregnancy, infancy and the formative childhood years. Pregnancy: Chiropractic adjustments can help provide the expectant mother and unborn child with a more comfortable and less physically demanding pregnancy. Dr. Sandez is certified in the Webster Chiropractic Technique, which is often used for prenatal care and can be effective in correcting breech presentations, if they are due to pelvic and sacral alignment problems. Infants: Many infants can experience misalignments, especially in the aftermath of physically demanding deliveries. Dr. Sandez’s ability to identify these subluxations can pave the way to treatments that address common infant problem areas. 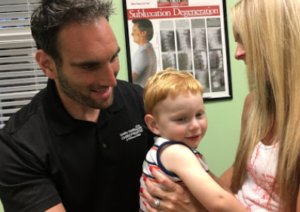 Children: Dr. Sandez is a member of the International Pediatric Chiropractic Association and is highly skilled in the treatment of children and the common difficulties they encounter as a part of their active lives. If you’d like to learn more about the chiropractic and wellness care we can provide,please Contact Us online, call 919-535- 3091, or Schedule an Appointment. Sandez Chiropractic is proud to serve families — and impending ones — in Cary, Morrisville, Raleigh, Wake Forest, Apex, Holly Springs, Fuquay-Varina, Garner, and the surrounding Triangle NC communities. There is no need to get a referral to make an appointment, and we file with and accept most insurances. 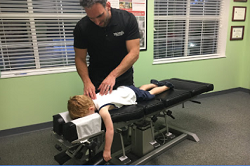 For further information and articles about chiropractic care for children, please visit the International Chiropractic Pediatric Association and Holistic Pediatric Association.